"In February, Timothy couldn't even sit up. Now he is our greatest joy. He wants to stand all the time," recounts Anne Muchiri, a social worker assisting Special Olympics Kenya. Since 1992, the United Nations General Assembly has observed the International Day of Persons with Disabilities on December 3. On this day, individuals and organizations across the globe celebrate the everyday gains - and challenges - of individuals with disabilities. Catholic Relief Services is proud to be one of the few international development organizations that have recognized and prioritized the challenges of individuals with disabilities within core programming and this year, has many more gains to celebrate. development programs for children with intellectual disabilities in Kenya, or providing technical assistance for adaptive employment in Lebanon, Catholic Relief Services is emerging as a global leader in inclusive programming. People with disabilities – who account for 15 percent of the world’s population (over a billion people) – are a part of every society. Many face social, economic and cultural barriers limiting their access to full and effective participation in society, including economic empowerment, education, basic social protections, and employment and health services. It is these barriers, rather than the physical, mental, intellectual or sensory impairments, which disable individuals, and contribute to poverty and disempowerment. The United Nations Development Program estimates that 80 percent of all persons with disabilities reside in low-income countries and while people with disabilities represent approximately one in nine people worldwide, they are one-in-five of the world's poorest people. Individuals with intellectual disabilities are frequently the most underserved subset of persons with disabilities and account for approximately 3 percent of all populations. Together with their families, they are marginalized by their relatives and communities, vulnerable in cases of conflict or natural disasters and often excluded from campaigns aimed at building their resilience. Through a global partnership with Special Olympics, Catholic Relief Services piloted and has now begun to expand the most comprehensive early childhood care and development program for individuals with intellectual disabilities in Kenya, and possibly a global first. Deep within Kawangware, Kenya's second largest slum, four early childhood development centers from the Adventist Centre for Care and Support (ACCS) have been transformed into centers of inclusion which stand out like beacons of hope to the many parents who isolate their children with intellectual disabilities from the stigma, costs and burden of dependence that the outside world presents. At these centers, children have an opportunity to play, learn, and receive health interventions while parents and caregivers form support groups where they are counseled and capacitated to care for their child, their families and importantly, themselves. For many families, the results have been dramatic: "In February, Timothy couldn't even sit up. Now he is our greatest joy. He wants to stand all the time," recounts Anne Muchiri, a Social Worker assisting Special Olympics Kenya. 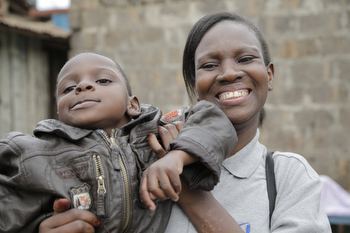 Many children like Timothy fail to receive the services they so desperately need because they lack a birth certificate. Be it through administrative gaps, or deliberate holes carved by cynical health care professionals or disappointed parents, many children with intellectual disabilities fall through these cracks and fail to register in life, through others' failure to register their birth. Fortunately Catholic Relief Services are leading these efforts aimed at ensuring that individuals with disabilities are able to stand up and be counted - in Kenya - and many countries around the world. On December 3, we celebrate Timothy's accomplishments and commit ourselves to always offering a hand up, rather than a hand out, to individuals with disabilities around the world.